Living a Fit and Full Life: My Baby’s Heartbeat Bear is the ultimate pregnancy keepsake and the perfect gift for expectant mothers! My Baby’s Heartbeat Bear is the ultimate pregnancy keepsake and the perfect gift for expectant mothers! There’s nothing more awe-inspiring for expecting parents than the sound of their baby’s heartbeat, heard for the first time during an ultrasound appointment. Now this milestone moment can be preserved forever thanks to the ultimate pregnancy keepsake: My Baby’s Heartbeat Bear. This innovative gift provides everything needed to capture that precious sound and create a permanent treasure. The My Baby’s Heartbeat Bear kit comes with an adorable stuffed animal and a red “heart” recorder. A second recorder can be ordered to include a voice message from someone special. Simply take the recorder to your ultrasound appointment and easily switch it on to capture 20 seconds of baby’s heartbeat. (If you have already recorded the heartbeat on your phone or on a CD, it can be transferred to the heart recorder.) Then, unfasten the Velcro closure on the back of the stuffed animal, insert the recorder into the interior drawstring pouch, knot the pouch, and finally re-fasten the Velcro. To listen to the heartbeat, simply press on the animal. To stop, press again, or simply wait 20 seconds. My Baby’s Heartbeat Bear is the ultimate pregnancy keepsake and the perfect gift for expectant mothers! After having a miscarriage with my first pregnancy I can without a doubt that I would love nothing more than to have a My Baby’s Heartbeat Bear that would play his or her heartbeat. Even now that I have 4 kiddos, I would love to be able to remember that amazing heartbeat sound from each and every one of them. My Baby’s Heartbeat Bear is the perfect keepsake for moms that will be treasured for all time. In all honesty, a My Baby’s Heartbeat Bear would be my favorite baby shower gift! 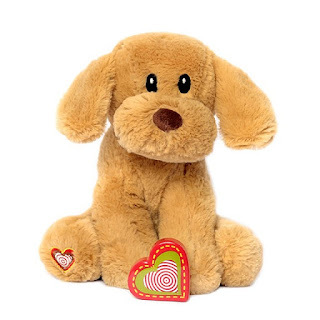 My Baby’s Heartbeat Bear has a huge selection of stuffed animals like a puppy, unicorn and so many more that would make excellent gifts for expectant mothers! Click HERE to find a store near you that sells My Baby’s Heartbeat Bear! Click HERE to learn more about My Baby’s Heartbeat Bear! Follow My Baby’s Heartbeat Bear on social media!